After talking about decluttering the surfaces in my home to make cleaning more efficient and quicker at one of my talks, one of the members of the audience asked me “But what about ‘Gemütlichkeit’, what do you do about candles?“ I think zero waste, minimalism and “Gemütlichkeit,” or “hygge” as it is called in Denmark, aren‘t mutually exclusive (fun fact: ‘hygge’ has overtaken ‘minimalism’ as a google search term in October 2016). Decorating with natural materials such as pine cones or potted plants is zero waste and can also be pretty minimalist. Stearin can be derived from animal sources or from vegetable sources such as palm oil. 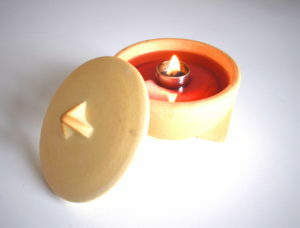 Soy candles also form part of the stearin candle category, as the main component of soy wax is stearic acid. While both vegetable sources are theoretically renewable sources, soy and palm oil production definitely have their problems. Both are farmed in massive monocultures with a high use in pesticides which wreak havoc on the ecosystem and wildlife in countries such as Brazil or Indonesia. On the flip side, stearin-based candles were not found to emit any considerable amount of toxins. Beeswax is a natural wax from the wax-producing glands of bees. While this is not a vegan option and large-scale bee farming is very similar to all other types of factory farming, I believe that there is some value in supporting your local, small-scale beekeeper. I talked to my local bee keeper and he told me that he harvests only a small amount of beeswax and uses most of it to prepare the frames for the hives in the next season. Based on this information, I decided that to me beeswax is a much too valuable resource to burn. 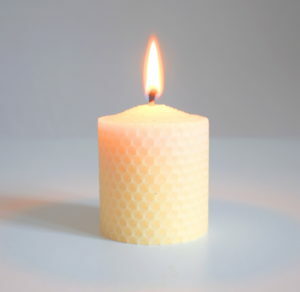 I‘ve decided to use the small amount of beeswax I buy in cosmetics, but if you decide to use beeswax candles, they are a lot less toxic than the paraffin ones. You can make your own candles from any kind of leftover candle wax. Simply ask family, friends, giveaway groups or your neighbourhood Italian restaurant for their leftover candle stumps. Doing this you don‘t generate any new demand for candles, they‘re second hand, so to say. You‘ll probably be able to find wick by the meter at your local craft store or you can even make your own from some cotton knitting yarn. Weck jars are great if you want to pour your candles into a glass, because they are relatively heat resistant, but you can also make hand-dipped candles. Maybe you can find a candle manufacturer near you who makes new candles from donated wax, such as SinnLicht. If, like me, you are too lazy to make your own candles, you could go for a wax burner. This nifty contraption consists of a ceramic bowl with a glass fibre wick which is held in place by an aluminium ring. You can feed the wax burner with leftover candle stumps. My slighlty pyromaniac husband thinks that this part is really fun. 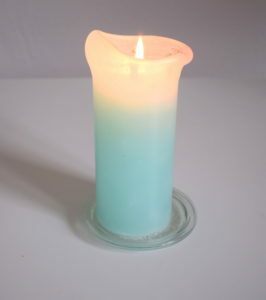 The glass fibre wick lasts a long time, as long as you don‘t use beeswax or candles with glitter particles in it and keep it covered when it‘s not in use to protect it from dust. You can also replace the wick if it doesn’t work anymore. Now, if there is a chance that the candle rests you‘re using are made from paraffin, you should take care to properly ventilate the space you‘re using it in and you should not use it every day. Homemade vegetable oil lamps are another great zero waste option. It‘s relatively easy to buy vegetable oil in bulk and you can even burn used cooking oil. The fumes from vegetable oil are less toxic than those released by paraffin candles. 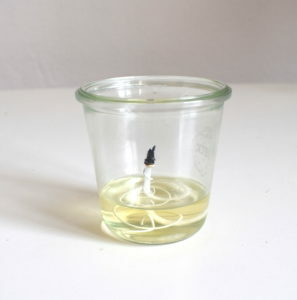 To diy a veg etable oil lamp, you can simply form a wick holder from a piece of wire, thread the wick trough it and place this into a dish containing the oil you want to burn. Here, I used the leftover wire from a spiral notebook (I probably should have stripped the white paint off before using it). In place of a store-bought wick, you can also plait your own from a 100% cotton knitting yarn. I left my oil lamp on for three hours and it only used 11g of oil. It might also be possible to use the wax burner with vegetable oil. I have not tried that yet, but it would be awesome if that worked. The most sustainable oil to use in your lamp is probably the one that is produced closest to you, such as sunflower seed oil or rapeseed oil in Germany, but olive oil if you live in a Mediterranean country. Moon jars or sun jars also radiate warm light without causing a lot of waste. They are typically flip-top jars with a small photovoltaic cell, a battery and an LED light. Exposure to sunlight charges the battery and then you can switch on the jar when it‘s getting dark outside. However, it seems to be a bit complicated to find a good quality one. Hi! I’m actually using WordPress. My brother recommended I may like this website. He was entirely right.This submit actually made my day. You cann’t believe just how somuch time I had spent for this information! Thank you!